The Editorial is completed either Wednesday or Thursday of each week, so questions around there are likely to be the first ones viewed. However, to find enough questions that we can answer for the Editorial, we usually need to look through the entire week's questions, so generally speaking it doesn't matter all that much when you submit them. The Fat Cat is one of a small number of Petpets that had their art updated or dramatically altered into a different Petpet some time ago. They no longer exist as items at all, as they have been overwritten. (For example, the Fat Cat is now the Baraga Petpet.) 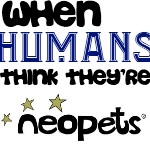 However, if these "replaced" Petpets were equipped to a Neopet prior to the change and were never removed, then they still remain intact with their original art and item name. If they are ever removed from the Neopet, they will instantly update to the current art and item name. We checked on the Elephante Lamp Collectable Charm and confirmed that it is, indeed, set at a restockable rarity. It is r99 however, making it a super-rare item, and of too high a rarity to appear in the sidebar item search. Apparently I'm just annoyingly rare, not broken. No; only Petpets with a rarity of 101 or less are possible from the Petpet Lab Ray. Retired items and Petpets are generally set to rarity 180. However, all "lab ray only" colours, such as chocolate, gold, etc. are available through the lab ray, regardless of the rarity of the Petpet. Well, this is just embarrassing. You're quite right that they exist; it seems they were just overlooked. They are now properly activated and attached to the paint brushes, so you will now get the hat when painting an Elephante one of these colours. If you have already painted an Elephante one of these colours, but didn't receive that hat, please send in a request for one to our Support Department. Hahaha, well, a lot has happened that we could have never foreseen, though we must say that the amount of effort it took to make Neopets capable of wearing clothes was... astounding. Our artists worked relentlessly for a very, very long time to make it possible. As always, we do our best to give you the best current information we have in Editorials, but just like any newspaper, what was true then (or even now) may be drastically different in the future. x__X We further salute such dedication. TWO gold stars! Darn it, now we need to find a new premise for our upcoming Neopets reality TV show. Let us huddle for protection. One pet's happiness is another's sorrow. Never, ever taunt a Yooyuball team. Luckily we have our friend Veels to look after us, and he's very good at Meetings and Twisting Their Legs, which I think usually means he just gets what he wanted at the start.